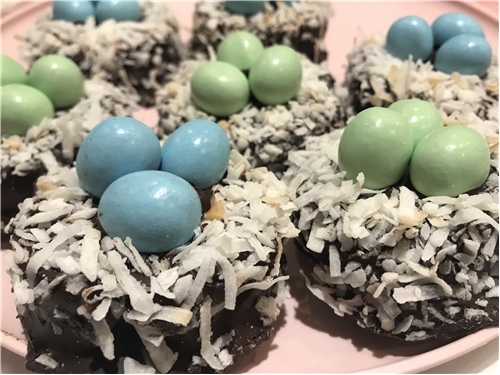 Our Coconut Brownie Nests are back just in time for your Springtime Celebrations! Perfect for your Easter dessert or for your bunnies Easter Basket! Our Decadent Classic Chocolate brownie enrobed in Guittard Chocolate Coating and covered in Lightly Toasted Coconut. The Colorful Eggs are Jordan Almonds. A springtime favorite! Adorable & Delicious! Approximately four ounces each. Six to a box. Available in Classic Chocolate. Unless otherwise requested these will ship for Easter Delivery.